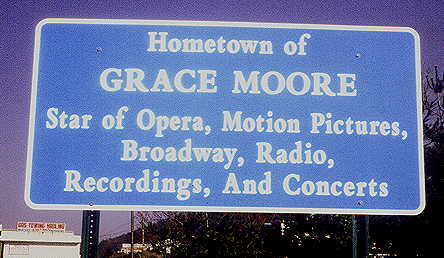 Grace Moore, one of America's favorite and widely known operatic stars, was a native Tennessean. She was born in Slabtown, Cocke County, Tennessee, on December 5, 1898, and was raised in Jellico, Tennessee. Although since torn down, this is the house that Grace Moore grew up in. a charming black and white film produced by Columbia Pictures in 1934 which made Moore a sensation at the box office. Miss Moore used her talent as a way to reach out to people. This human quality in her personality helped earn her the fame she worked so hard to achieve. Miss Moore married Valentin Parera in a wedding ceremony held in Cannes, France, on July 15, 1931.It was an extravagant wedding for the time period. Among the many distinguished honors she received from various countries was the decoration as a chevalier of the Legion of Honor of France in 1939. In 1937, she was commissioned a colonel on the staff of the governor of Tennessee, and was also made a life member of the Tennessee State Society of Washington, D.C. Between her operatic engagements, she appeared on radio and as a soloist at concerts throughout the United States and Europe. These performances included those given for the United States occupation forces in Vienna and Salzburg in Austria, and Heidelberg and Wiesbaden in Germany. She was also known for her exquisite gowns. Here is one such example from her extensive collection. In Copenhagen, Denmark, on January 26, 1947, Grace Moore boarded a KLM DC3 to fly to Stockholm. The aircraft taxied out to the runway and was cleared to takeoff. The aircraft rotated and climbed to an altitude of about 150 feet. The aircraft stalled, crashed to the ground and exploded. On the evening before her death, Grace Moore had sung to a packed audience of more than 4000 people. Tragically, Ms. Moore lost her life in that plane crash following a concert which ended in a standing ovation and countless encores. She was buried in Chattanooga, Tennessee. "Analyzing what you haven't got as well as what you have is a necessary ingredient of a career", Grace Moore once said, and with those famous last words, Grace Moore: Life of a Legend is concluded. Cathy Rhoden, a native of Ms. Moore's hometown of Jellico, Tennessee has written a play entitled, More Grace which is scheduled to premiere during the 2002/2003 season. The play chronicles Ms. Moore's life in a candid but refreshing glance and offers insight into the life of the Tennessee Nightingale. Visit this site often for official information about the Premiere. If your theatre group is interested in learning more about performing More Grace, you may get additional information by contacting the author at webmaster@gracemoore.net.